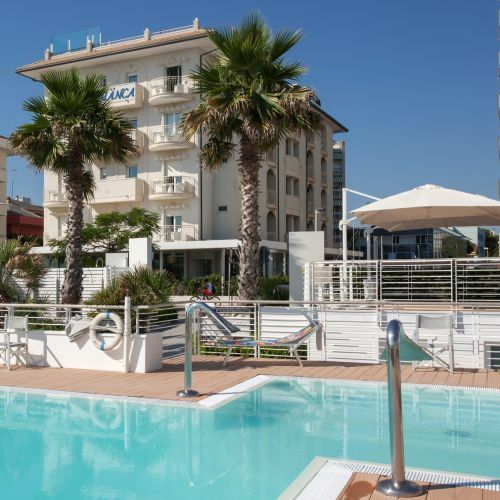 Hotel Cà Bianca: wellness and relaxation with a seaside view! Our rooftop spa area features an open-air professional Jacuzzi with massage jets and water that is heated to 30°C, as well as a massage area that is sure to help your physical and mental well being. Access is available upon reservation for a reasonable price and this pool can accommodate up to 4 people who can enjoy all the benefits provided by water: hydrotherapy, aromatherapy with rose essential oils and chromotherapy. For total tranquillity, the Jacuzzi is located in an elevated area and protected by reinforced, transparent glass, which will also offer a splendid panoramic view over the sea. Here you can also relax in our extremely comfortable ergonomic sun loungers under the shade provided by umbrellas or enjoy the sunset with a book in the soft seating areas, far away from any hustle and bustle. The more fitness inclined can work out in the gazebo-covered gym that is complete with brand new Technogym equipment. Our Riccione Hotel stands out from the rest thanks to its wellness focus and also offers you the opportunity to access a wider range of services, thanks to agreements with the Wellness Centre located on the beach, right in front of the hotel, where you can choose from different beauty and wellness treatments so you do not have to stray too far away from your umbrella!